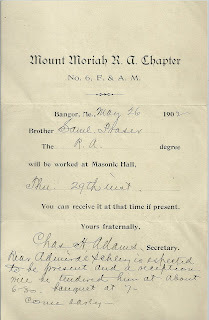 1902 notice from the Mount Moriah Royal Arch Chapter, No. 6 F& A.M., Bangor, Maine, dated May 26, 1902. 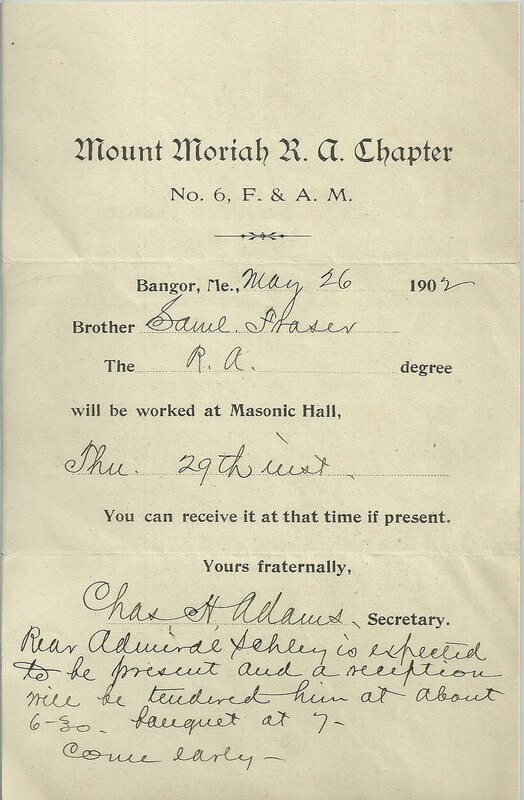 Addressed to Brother Samuel Fraser, who I believe to be the Samuel Fraser born abt 1868 in Massachusetts, who married Jennie M. Landy in 1908 in Bangor. Jennie was born about 1882 and was the daughter of William and Mary Landy. Signed by Charles H. Adams, Secretary. Charles Herbert Adams was involved in the lumbering business and was treasurer or the Penobscot Lumbering Association. He was born in 1859 in Bangor, Maine, the son of Charles Kingman and Mary Elizabeth (Bayley) Adams. There's an interesting note at bottom that "Rear Admiral Schley is expected to be present and a reception will be tendered him at about 6:30. banquet at 7. Come early -"
Winfield Scott Schley (1839-1911) had a long military career, starting with the Civil War and ending with a bit of controversy in the Spanish American War. In between he had some interesting experiences in Korea, in the South Shetland Islands and in the Arctic. He wrote Forty Five Years Under the Flag and The Rescue of the Greeley. He was the son of John Thomas and Georgiana Virginia (McClure) Schley. Fittingly, he's buried at Arlington National Cemetery. Hopefully you will find this memento interesting - thanks for stopping by!